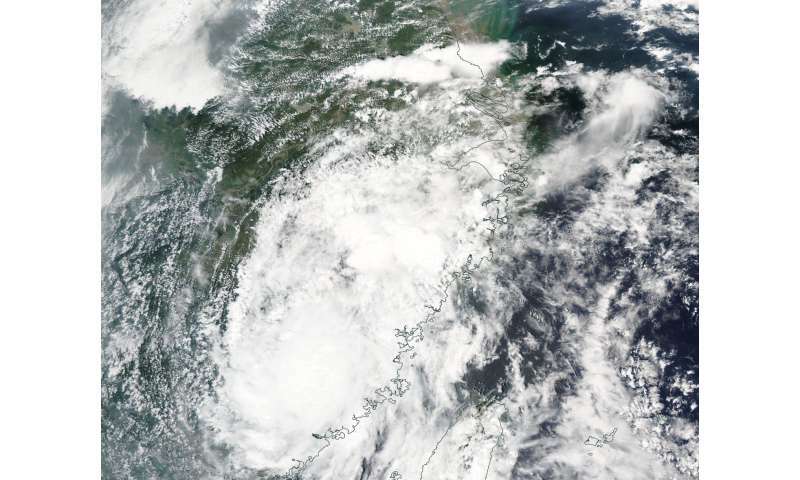 NASA's Aqua satellite captured an image of Tropical Storm Nesat after it made landfall its second and final landfall in eastern China. Taiwan's Central Weather Bureau reported that Nesat made landfall on July 29 at 7:10 p.m. local time at Su'ao in the northeastern county of Yilan, Taiwan. Nesat then crossed the island nation in a westerly direction and made its second and final landfall on July 30. In eastern China's Fujian Province, more than 3,100 people were evacuated as a precaution. Nesat made landfall in southeastern China on July 30 around 0300 UTC (July 29 at 11 p.m. EDT). Nesat made landfall in southeastern China's Fujian Province. On July 30 the Moderate Resolution Imaging Spectroradiometer or MODIS instrument aboard NASA's Aqua satellite captured a visible-light image of Nesat after it made landfall for the last time. The storm appeared as an elongated area of clouds along China's southeastern coast. The Joint Typhoon Warning Center issued their final warning on the system at that time when Nesat's center was near 25.9 degrees north latitude and 119.3 degrees east longitude. Nesat's remnants moved to the northwest and further inland where it dissipated.